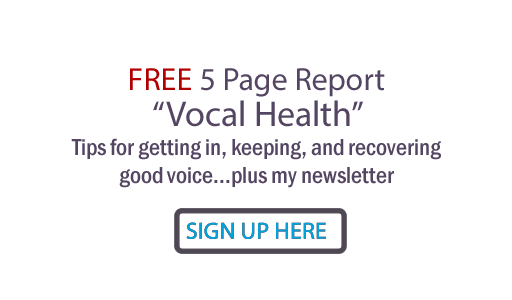 Judy Rodman - All Things Vocal Blog: Chronic breathiness or hoarseness? Suspect vocal damage! Chronic breathiness or hoarseness? Suspect vocal damage! I was eating lunch when my one of my new students' mother called. "Hello", I said. "Well, you were right", she said. Sadly, I had guessed I would be right. It wasn't the first time I'd correctly suspected vocal damage. She had taken her little actress daughter to the doctor after my suggestion at her last voice lesson to get her vocal cords inspected. Her doctor found lesions on both vocal cords. He told them she should not talk for a week and that it will be a long, long time before she should attempt to sing. She had been scheduled to audition for two productions... one a movie... and it's all on hold for now. I knew something was wrong because I had way too much trouble getting this little girl to be able to sing in her head voice. When I did gently coax a head tone out of her, nothing I suggested could help her sing very far up the scale, and those notes were very breathy. She tried her best to follow my directions, but she could not focus her spread tone into a healthy, clear, bell-like sound. The breathiness in both her chest and head voices and her limited range cautioned me to stop the vocal training until she could get checked out. And thank God her mother took the initiative and the discovery of vocal injury was made. Anything which keeps your vocal cords from closing properly, such as a bump of tissue caused by injury, swelling, any kind of lesion or other obstruction, will cause problems such as breathiness, hoarseness, fatigue, vocal cracks and other limitations in your speaking and singing voice such as an inability to sing in head voice. Fortunately, these symptoms are a cry for help... which needs to be heeded. It is imperative to get a correct diagnosis as to the type of vocal lesion present, because some injuries respond quite well to rest and corrective vocal training, and some require surgery. And sometimes the lesion is malignant. Don't fool around with chronic breathiness or hoarseness. Get to the bottom of the problem. For a "symptom tree", see: http://voiceproblem.org/disorders/vflesions/index.asp . If you suspect a problem, make an appointment with a doctor who can inspect your cords and who knows about singers' voices (get references). You can actually click a link and hear examples of some types of vocal damage at: http://www.gbmc.org/voice/disorders.cfm . Here's a wake up... you can cause your vocal cords to hemorrhage (bleed) from just ONE episode of traumatic vocal abuse. A jingle singer I worked with in Memphis named Janie Fricke was diagnosed with this many years ago. Good news... with rest, she did fully recover - and she became a highly lauded country singer with a major hit career. I myself had vocal damage from the insertion of an endotracheal tube (I was on a ventilator for a while many years ago). With the help of my vocal teacher Gerald Arthur, I fully recovered and then went on to my own career at MTM records. This mother had been told for years that her daughter's breathy sound was natural for her... that there was "nothing wrong - that's just the way her voice sounds". Therefore, her daughter has been re-injuring her vocal cords constantly. Hopefully, this talented and precious little girl's voice will mend with time. When her injury sufficiently heals, she will need vocal training to fully recover. Read into this post your own cautionary tale. Sometimes you may wish to make a breathy sound for a momentary "effect", but don't fool around with chronic breathiness that you can't focus into clear tone. If you think you have a problem, get checked out with a good voice teacher and/or a doctor who specializes in voices.